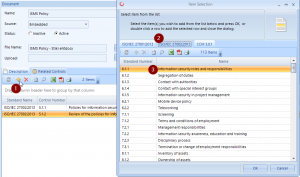 The RM Studio Document Store is an excellent feature that allows users to include documents of any kind that pertain to the risk management strategy. These documents could be the Burden of Proof for an implemented control or policy covering several implemented controls. 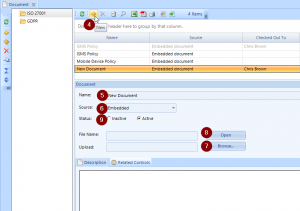 Embedding or linking to documents from the RM Studio Document Store can even go a step further by allowing users to link specific documents to controls or requirements. If you are operating with multiple risk assessments and treatments, linking the documents to the controls and requirements makes the process very fluent. 1) To add a document to the Documents store, first create a Document Category by using the ‘+’ button as usual. 2) In the popup window name the Document Category. 3) Assign to a Root Category or Parent Category (select from a drop down list of Root Categories). The Root Category is for projects such as the ISO 27001 certification or similar. The Patent Category is used for grouping documents under a particular category for easy management of documents. 4) Click the ‘+’ button in the toolbar to the right of the newly created document category and enter a name for the new document. 5) Name the new document (can be different than the actual file name) and input a Description for the document. 6) Choose the Source of the new document. Embedded means that you want to import the document into RM Studio, and this is most useful for documents that are reviewed and revised annually or less, as you must import a new document every time you make an edit to the document. 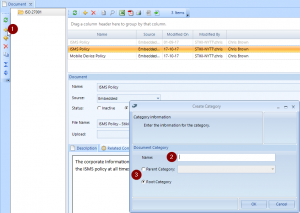 External is used for linking to a document on an external source on the network, such as the organizations SharePoint, documents center, wiki, or organizational manual. Information sensitive or access controlled documents should be considered for linking to the documents. 7) If you are choosing to embed the document, click the ‘Browse’ button and find the document on your system. Select the file and then click on ‘open’ to import to RM Studio or create a link to the document from RM Studio. 8) Use the ‘Open’ button to review the document once imported or externally linked (if the document was linked from an access controlled source and you don’t have access to the source, you can not open the document). 9) The Status is used to set a document as Active or Inactive within RM Studio. Use the inactive status for documents that are no longer applicable to your implementation process (if you have updated the ISMS policy for the new year, but the old ISMS policy was used in previous assessments). Now that the document is stored (on the database or linked externally) you can assign the document to Related Controls. By assigning the controls to the document, the data can easily be accessed and reviewed in the assessments, saving you time and effort, as well as confirming that a control has been implemented. 1) Check out the document if it isn’t already checked out to you, then select the ‘Related Controls’ tab next to the description. 2) In the popup window choose the standard you want to link controls from. 3) Select all the controls form the list that are related to the document. You can link controls from multiple standards if you have already deployed the other standards.